⋆New for 2017⋆: The FC Dezaemon Fans forum! A fan community designed for sharing and discussing all things related to Dezaemon on FC. Any questions, comments, or you want to share your creation, head over to the forums! 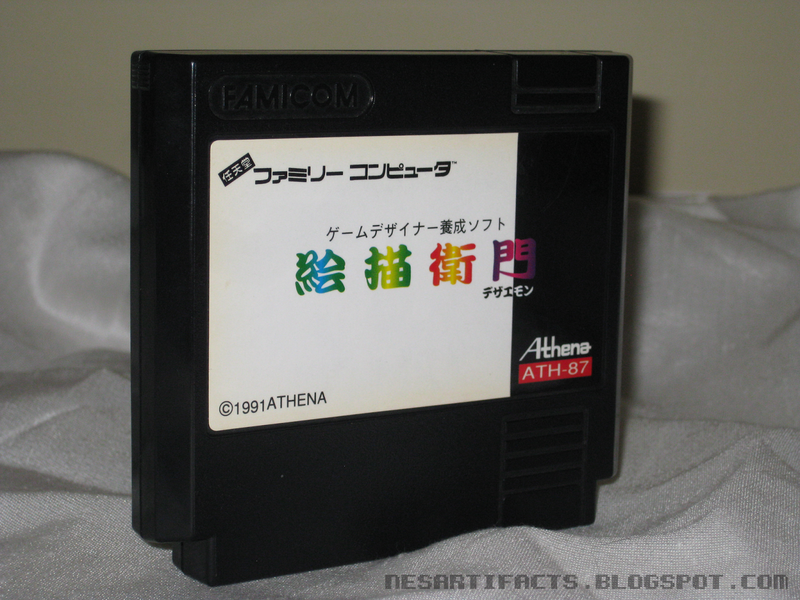 Dezaemon is a Famicom game released in 1991 by Athena Co. LTD. It only saw a release in Japan, so it's largely unknown to western audiences. Dezaemon is the first in a series of "Shoot 'em up construction kits", and is a solid effort for the limited 8-bit console. Perhaps one problem hindering its broader appeal is the lack of English documentation, which can be essential in mastering this relatively intricate game. 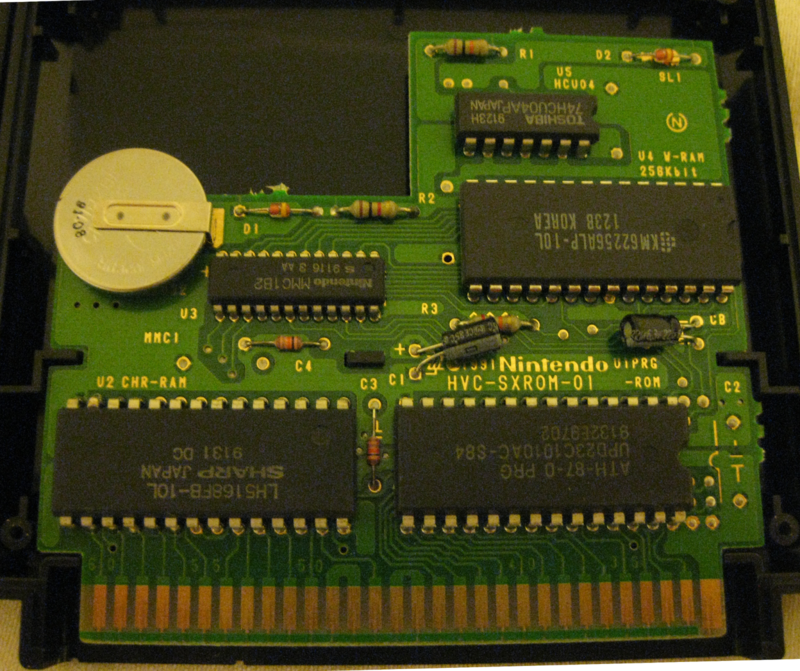 Dezaemon features a full graphics and sound editor, as well as the ability to save via battery back-up. 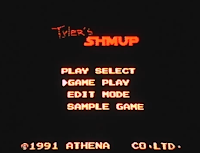 Dezaemon uses a special SXROM mapper for saving, which as of current, has issues on emulators and flash devices (the game will run, but saving via SRAM does not work). 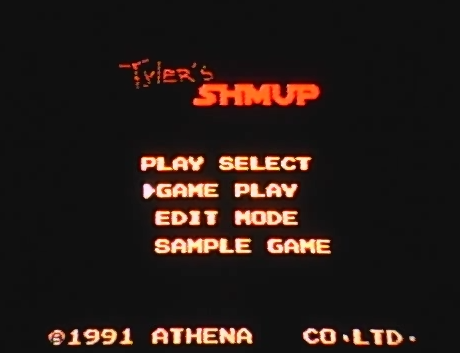 "Sample Game" - Play the sample game built-in to the cartridge. 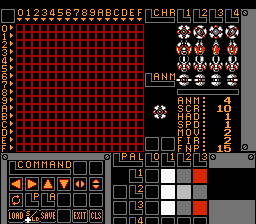 The ship design area with the built-in sample game sprites loaded. Here is where the creation starts, the editor interface! The editors are largely the same throughout, but each have a few different parts. 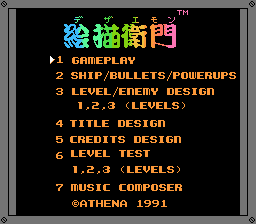 This one, specifically, for the Ship/Bullets/Power-ups sprites. B - "GET" - gets the selection. This is how you GET a color to use, GET a sprite, as well as draw on the canvas. A - "PUT" - puts the selection. After you draw something, you can PUT it into the tile selector (press A in the tile area you choose). Think of this like the PASTE command on Windows. 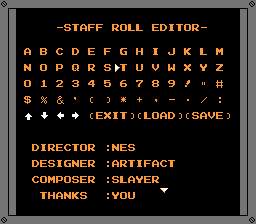 START - this will exit the screen without saving (skips the exit/save dialogue). *Make sure to save before pressing the start button if you've just created something new! The editor consists of a 16x16 pixel canvas/drawing area, this is where you draw your sprites. 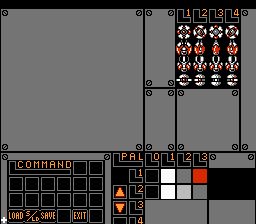 To the far right of the drawing area is the tile selector, this is where the sprites you made are placed. 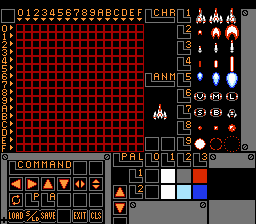 *note - for this menu, the spots are reserved for certain sprites, for example "CHR " is for the ship sprites only, etc.. Arrows - move sprite around in canvas. Double Arrows flip the sprite, horizontally or vertically, respectively. Rotating Arrows - rotates the sprite 90 degrees. "P" - fill canvas with selected color. "CLS" - CLear Screen, clears the drawing area. This is where you choose the colors for your designs. There are 2 palettes, each consisting of 4 colors (1 is transparent). The up/down arrows cycle through the palette colors. 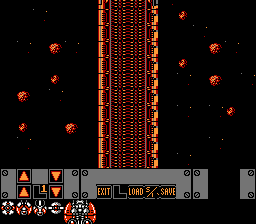 Now you've got your main ship/bullets/power-ups done, it's time to make a level with enemies! 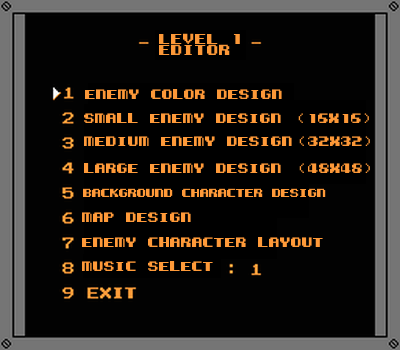 Pictured below is the Level Editor menu for Level 1. There are 3 different levels you can make. 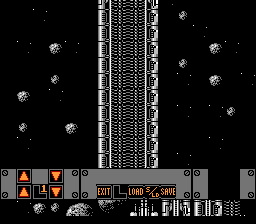 To make Level 2, or 3, you select them from the main menu under Level Design. This is where you'll spend most of your time, the meat and potatoes of the game if you will. 1) Choose the palette/colors for your enemies. 4 different enemies, each with 4 frames of animation. 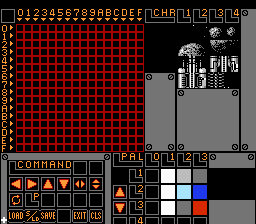 Notice that now on the enemy design screen there is a new section below the sprites. This is the enemy attributes portion. 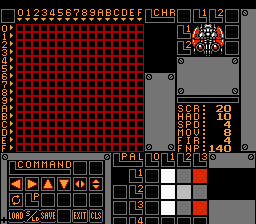 4 tiles (2x2) which composes 1 medium-sized/mini-boss enemy. No animation. Same navigation as above, but bigger sprite. Same as above but with the biggest sprite. 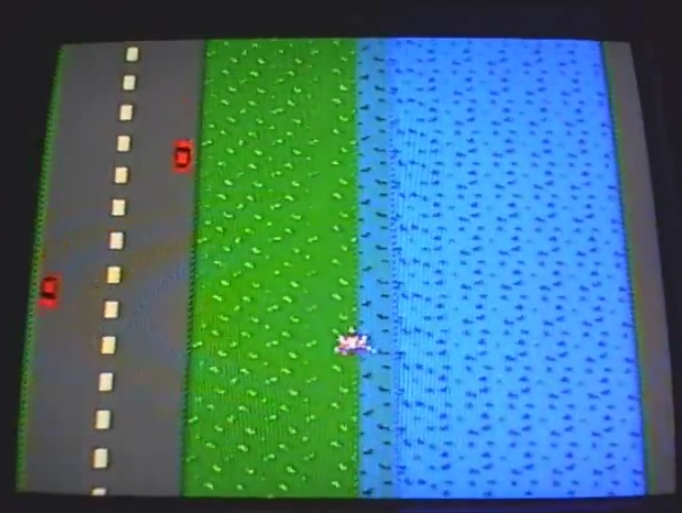 As mentioned above, the enemies' movement and fire patterns are adjusted using the MOV/FIR attributes. *Note - Large/Medium enemies have a different movement pattern table than Small enemies. All enemies use the same FIR attribute table though. 16 tiles to create whatever scenery you like. Here is where you place the scenery objects you created. 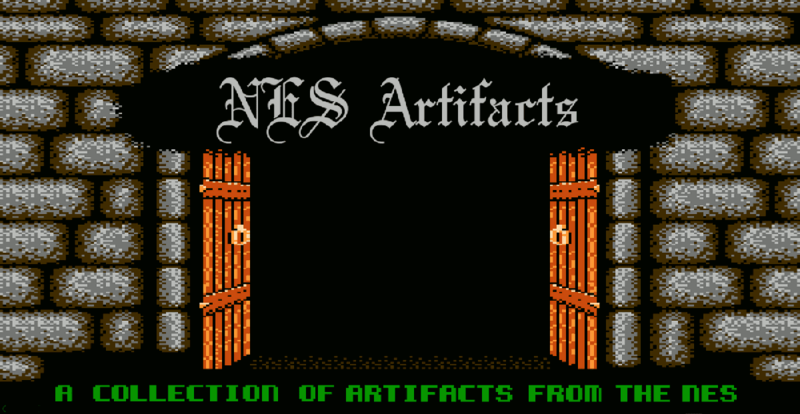 The objects are laid out at the bottom of the screen. Simply click and place them into your level using the B button. The arrows scroll the map up/down. Here is where you place the enemies you created into your level. * Helpful tip * - You can use a turbo controller to speed up the tile placing/erasing process. 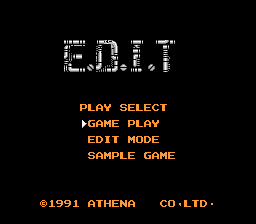 Here is where you make the title screen for your game! 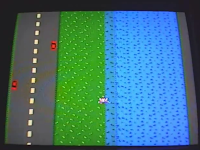 It consists of a 7x2 tile area, or 112x32 pixels. Here is where you make the credits. 8 characters limit. Navigate using the arrows. "B" button places the letter, "A" button erases the letter. This is where you can play-test through a level that you made. 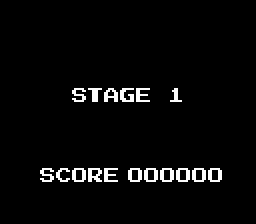 You can select between levels 1,2 and 3. This is great for debugging. Last but not least, the music composer! 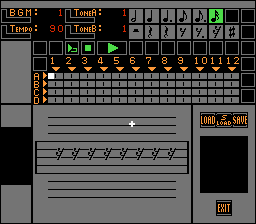 This is actually a fairly decent music making machine, pre-Mario Paint. It includes a DPCM drum kit as well as tone and tempo control. Notes: Half note, Quarter note, Dotted Quarter note, Eighth note, Dotted Eighth note, Sixteenth note. On the far right of the Rests is the Sharp. Musical Staff - This is where you place the notes (3 octaves). If you've skimmed through the entire guide you should have a pretty good understanding of Dezaemon, now the only thing that limits you is your imagination. Enjoy! It'd be cool to see what people can make with this fun kit. Feel free to share pics, videos, saves, etc. of your creations!